Yeah! That’s me behind that lovable face. Who is the “me”? For all you know, Joe Blow can and could be anybody. Actually, he’s not really hiding. So, why not just identify him? Or, is it them? Who knows? Number One Nobody! Born in Eureka, (Fifth generation) raised in Humboldt County. World traveled and life educated. American refugee. Lives forever. This report is about fair and honest observations and not about opinions. Joe Blow knows there are risks involved in such an endeavor, but that is not why he or she, (or is it they? ), write behind the pseudonym, Joe Blow. Joe Blow is and always was a “NOBODY”! To objectively write “observations” he must remain a “NOBODY.” To become “somebody” is to interject personality with the logical worthless opinions that accompany that person(s). For Joe Blow to lose his state of obscurity would destroy his Report. Bullies, we all know, exist by sucking off of other people they believe are only there to serve their wants and needs. Anyone that doesn’t conform to that bully’s opinions is a direct threat to that bully’s existence. They live only to control and will sink to whatever depths of deprivation necessary to achieve that goal. The transparent reality of a successful bully is to threaten violent assault on their victim’s person, property, family or whatever they think is important to evoke an emotional response; either anger or fear. Please be aware that the Joe Blow Report speaks for itself. You may or may not agree, but just remember, that is your issue. The Report is offered as a free gift to whomever desires to read it. Please accept it as such. The Report respects the rights of all individuals to be who and what they are. All the same there are consequences for what each individual does and does not do. If the Report stimulates a little thinking, it has fulfilled it’s purpose. Joe Blow fully understands that whatever is posted on the Internet or printed in newspapers or spoken on television or on the radio bears the responsibility for being PUBLIC property, albeit sometimes copyrighted. Let’s hope that those Joe observes and reports about understand that as well. In other words, if you do not want to read or hear about someone’s observations, keep quiet! Or if you’re going to stand up on a soapbox in a public place and spout off you’d better be ready for a rotten egg or two. Diatribe personally attacking the messenger, is not welcome. No where in the recorded history of these Reports does Joe Blow single-out any individual, group, business, political organization, religious organization, sexual orientation, nationality, government, country or any of the many other diverse peoples whose sole reason for existence is to promote or denigrate other people or issues for special and personal assault. To produce credible observations Joe Blow must remain neutral — no personal, political, religious or any other bias. These Weblog Reports are dedicated to thinking people. If the bigoted racist, the stupid, inane, moronic, paranoid, vacuous bully, or the ideologue believer that’s locked into the Dark Ages, is offended by this, then so be it. They need to grow up and get a life. That is how they expose the truth of themselves. Merely infer that what they say or write is lacking some sense of knowledgeable logic or that they ignorantly made a “simpleminded” mistake then sit back to see if it was a simple mistake or a malicious and deliberate deception. If it was a mistake or a simple error in judgment, people will usually acknowledge it, correct the problem and simply move on. However if they were deliberate and malicious, they get extremely angry, go ballistic and personally attack with all kinds of foul and malicious accusations. That is how they show everyone exactly who and what they are. They are thus judged by what they do and say and everyone is a witness to that judgment. At that point the Universal Law of Karma is enforced and these people receive exactly what they sowed. Joe Blow’s life endeavor is to practice the four governing principles of “The Four Agreements” as documented by Don Miguel Ruiz. Sometimes bullies can be very intimidating, specially when they threaten your family, your property and livelihood, making a perfect application of these Agreements very difficult. It’s in the trying that defines the character. It is in this “trying” that the Joe Blow Report finds inspiration in a world of bullies, descending into chaos and the Dark Ages. Hate Speech – Is There A Law? What is “hate speech”? Is it protected by the First Amendment? The Joe Blow Report asserts that Dave Stancliff, Columnist for the Times-Standard newspaper, engaged in hate speech in his two blog articles listed here and here. More importantly, the language he uses depicts and defines the Report’s writer(s) as some sort of insane, “Lone Wolf” right-wing, hate-group of domestic terrorist — a form of racism. Hate speech is a term for speech intended to degrade, intimidate, or incite violence or prejudicial action against a person or group of people based on their race, gender, age, ethnicity, nationality, religion, sexual orientation, gender identity, disability, language ability, moral or political views, socioeconomic class, occupation or appearance (such as height, weight, and hair color), mental capacity and any other distinction that might be considered by some as a liability. The term covers written as well as oral communication and some forms of behaviors in a public setting. If you’re a white man, this is what you are. It doesn’t even matter if your wife is black and you have an adopted child from India, or how many black friends you have, somehow you’re going to end up being a racist according to how the media portrays the white man as “racist whities”. 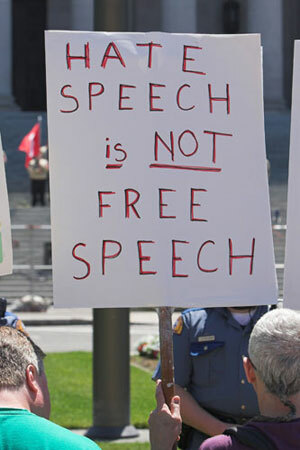 Various institutions in the United States and Europe began developing codes to limit or punish hate speech in the 1990s, on the grounds that such speech amounts to discrimination. Thus, such codes prohibit words or phrases deemed to express, either deliberately or unknowingly, hatred or contempt towards a group of people, based on areas such as their ethnic, cultural, religious or sexual identity, or with reference to physical or mental heath. The term “racist” is used to identify Stancliff’s commentary because he is determined to identify and define — stereotype this writer according to his own opinionated prejudices. They checked in again Monday when I posted a reply to their insanity. Whoever they are, they’re not oo bright! If you call someone a terrorist just because they don’t agree with you, are you then free to treat them like a terrorist? False accusers are liars. Liars are murderers. Everyone that supports a liar is also a liar and a murderer.